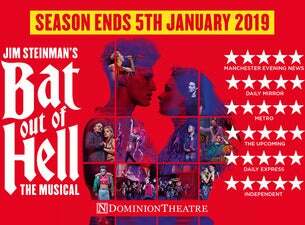 Following a smash hit season, Jim Steinman’s "gloriously over-the-top: part musical, part gig" (The I), Bat Out of Hell plays its final weeks at the Dominion Theatre. Bringing to life the legendary anthems of Jim Steinman and Meat Loaf, this critically-acclaimed production combines the magic of a musical with the immense energy of rock'n'roll. Join Strat, the forever young leader of rebellious gang ‘The Lost’ as he falls in love with Raven, the beautiful daughter of the tyrannical ruler of post-apocalyptic Obsidian. Don’t miss out. Booking until 5 January 2019 only!